More than ever, today’s marketers are turning to cloud-based digital solutions to improve efficiency and results. Tags have become the standard for data collection, leaving marketers reliant on them to gather the right data about visitor activity and take action to improve their experience. But the process of deploying and managing vendor tags can be chaotic for marketers, due to the technical nature associated with tagging, heavy development and QA costs, and the dependence of IT resources to make changes. 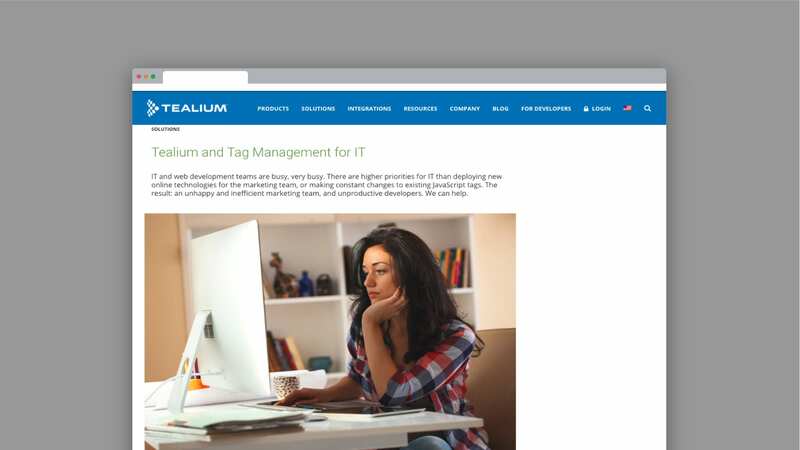 The Tealium iQ™ tag management system puts digital marketers in control of their online solutions, making it easy to add, edit, or remove any tag-based vendor without requiring assistance from expensive and often overloaded IT resources. In addition, Tealium iQ provides a rich source of digital marketing data to help marketers improve the effectiveness of their customer acquisition campaigns. Marketers typically rely on web development or IT teams to manually implement vendor tags, which saps valuable technical resources and impacts online marketing ROI. Tealium iQ makes it easy for marketers to deploy or manage any digital marketing vendor tag on their own, without requiring ongoing assistance. This helps marketers launch more digital campaigns faster and easier, increasing efficiency and overall results. Marketers can also test different solutions against each other so they can easily evaluate best-in-class solutions. Competitor websites are a click away, and studies have proven that just a one-second delay in page load can result in a seven percent decrease in conversions. Tealium iQ enables marketers to replace all vendor tags with a single master tag, removing the page bloat caused by multiple tags. Tealium iQ also delivers a number of techniques that dramatically increase page load speed, including asynchronous and conditional tag loading, script compression, and more. Using these techniques, Tealium iQ can dramatically improve web site performance. The data collected from digital marketing vendors typically comes in the vendor’s nomenclature and is based on their unique reporting structure. This means that prior to even processing the data—and well before marketing teams can take action—it must first be unraveled from the vendor’s nomenclature, translated to the organization’s unique data language, and then transported to their business intelligence tool. Tealium Event Store—a robust digital data repository that extends the value of Tealium iQ—provides organizations with an unprocessed, clean feed of their digital data, so that data-driven marketing teams can quickly turn the data they collect into action. Many marketers are stuck with at least a 24-hour delay on collecting visitor-level data from their vendors. Tealium understands that data-driven marketing teams need timely access to insights regarding their visitors website and campaign interactions with so they can make fast, informed decisions on how to improve results. Tealium Event Store provides users with an hourly feed of all of their event and visitor-level data.